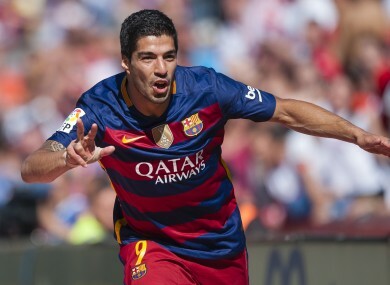 Hat-trick hero Suarez also finishes the season as the league’s top scorer. Suarez finished the season with 40 La Liga goals. However, they bounced back like champions as, inspired by Suarez’s 14 goals, they scored 24 times without reply in the last five games to win the title. Gerard Pique was twice denied by Andres Fernandez from corners, whilst the Granada goalkeeper also tipped over Messi’s driven effort from the edge of the area. Barca’s nerves were settled by a brilliant team move on 22 minutes as Neymar freed Jordi Alba down the left and his low cross was turned into an empty net by Suarez at the back post. Suarez then doubled Barca’s advantage when he nipped in ahead of Fernandez to head in Dani Alves’s cross at the near post. And the Andalusians had the chance to set up a nervy finish but former Barca winger Isaac Cuenca’s shot was beaten away by Marc-Andre ter Stegen. However, fittingly Suarez sealed a stunning season when he completed his hat-trick from Neymar’s unselfish square pass. Madrid’s record 12-game winning streak to end the season wasn’t enough to overcome the 12-point deficit they faced to Barca back in March. The three-time World Player of the Year opened the scoring as he swept home Karim Benzema’s mishit effort at the back post. Ronaldo’s second was slightly fortuitous as his header was deflected past the helpless Stipe Pletikosa by Pedro Mosquera. Email “Luis Suarez inspires Barca to La Liga title, as they pip Real Madrid on final day”. Feedback on “Luis Suarez inspires Barca to La Liga title, as they pip Real Madrid on final day”.